Balotelli, a former Manchester City forward, returned to the English Premier League in the summer after Liverpool signed him from AC Milan for £16million to help make up for the departure of Luis Suarez. However, despite constantly backing the Italian, it is now understood that Liverpool manager Brendan Rodgers is beginning to think that things aren’t going according to plan. Balotelli was substituted at halftime during the Reds’ 3-0 Champions League defeat at home to Real Madrid on Wednesday night, as Rodgers was not happy with his display in the opening 45 minutes. The 24-year-old was also blasted for opting to do a shirt swap with Madrid defender Pepe at half-time and Carragher, who played at Anfield for 17 years and is now a Sky Sports pundit, thinks the misfiring striker will leave before the start of the new season. “I’d be surprised to see him here next season,” the 36-year-old former center-back said. “It was just a panic; they needed someone. “They left it too late and they’ve bought different players in different positions instead of maybe going out, not spending the whole Suarez money on one player, but buying two or three big players. “A lot of the players have come in and done a decent job here and there, but nobody’s really done anything. 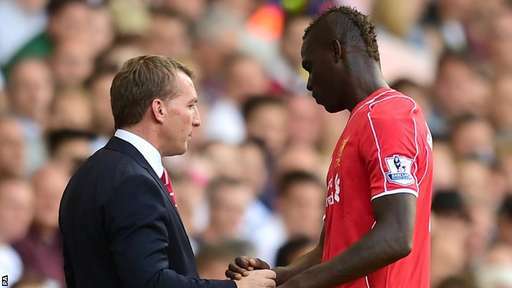 There are clearly growing concerns about Balotelli’s attitude on the pitch, but Liverpool will resist the temptations to sell him in the January transfer window. Sky Bet are backing the Reds at 1/10 to keep the controversial frontman past January, but have him at 16/1 to make a move back to Italy to join either Fiorentina or his former club Inter Milan.